Hence I tried in my little book “On the Witness Stand” to discuss for those interested in law the value of exact psychology for the problems of the courtroom. In “Psychotherapy” I showed the bearing of a scientific study of the mind on medicine. In “Psychology and the Teacher” I outlined its consequences for educational problems. In “Psychology and Industrial Efficiency” I studied the importance of exact psychology for commerce and industry. 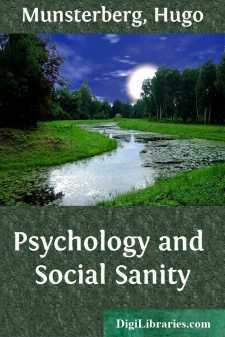 And I continue this series by the present little volume, which speaks of psychology's possible service to social sanity. I cannot promise that even this will be the last, as I have not yet touched on psychology's relation to religion, to art, and to politics.